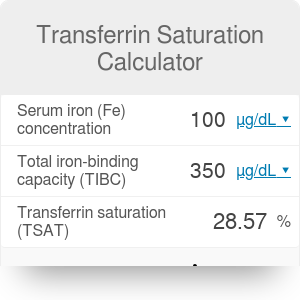 This transferrin saturation calculator will help to characterize the iron economy of your body. Transferrin is a specialized iron carrier protein present in our blood. Each transferrin molecule can carry up to two iron (Fe³⁺) ions. In this article, you will find out how to use our transferrin saturation calculator to compute and interpret different saturation values. While analyzing your blood test results, you may also want to calculate your anion gap. The percent value calculated here can tell you what fraction of all available transferrin carries chemically bound iron ions. As such, it is an excellent tool for assessing the balance between your body's iron uptake and output. It is often relevant to clinicians, as it is a cheap and relatively non-invasive method of monitoring the iron levels in the patient's body. To calculate your transferrin saturation using the second equation, click on the advanced mode button on the left. Typically in a healthy human, about one-third of all transferrin is saturated with iron ions. This leaves two thirds of all transferrin binding sites empty as a reserve, in the event of increased iron uptake. The reference values differ for children and patients during hemodialysis. Prolonged effects of the above factors may eventually lead to iron-deficiency anemia. You can use our hematocrit hemoglobin ratio calculator to keep an eye on your risk of anemia. Moreover, you might be interested in inspecting your absolute reticulocyte count to control the condition of blood-producing cells in your bone marrow. A saturation value higher than the reference range indicates that you have too much iron in your body. Such a disorder, called iron overload or hemochromatosis, may increase the risk of liver disease and many other conditions. Transferrin Saturation Calculator can be embedded on your website to enrich the content you wrote and make it easier for your visitors to understand your message.